He is a physically challenged person having lost a leg. But, he mastered dance with single-minded devotion and also played the lead in a movie titled Dancer. 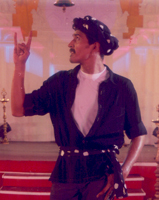 Keyar was the producer and director of this film. It won the jury members’ special prize at the National awards this year. Kutty is busy with his next project titled Tirupathi. A newcomer, Arjun, will be the director. The industry is very appreciative of the professional attitude of Kutty. Let us welcome him with open hands.